I had a major kitchen fail this week. I made butterscotch pudding, (well, I sort of made butterscotch pudding) and then I introduced butterscotch pudding to the garbage. I learned something really enlightening from this kitchen fail - there IS such thing as too much cream. Every single bone in my body wishes I didn't have to admit that. To sum it up, too much cream and butter in butterscotch pudding equals really tasty, really separated pudding. As I was throwing it out I thought, why the heck was I making butterscotch pudding in the first place? Is it 1973? It doesn't even have chocolate in it. It was a weird day. I got over it and made this Four Ingredient Chocolate Mousse Cake to redeem myself. After such a traumatic experience, I needed to feel comfort with something simple, something decadent, something modern - something that is more me. Butterscotch pudding is not me. 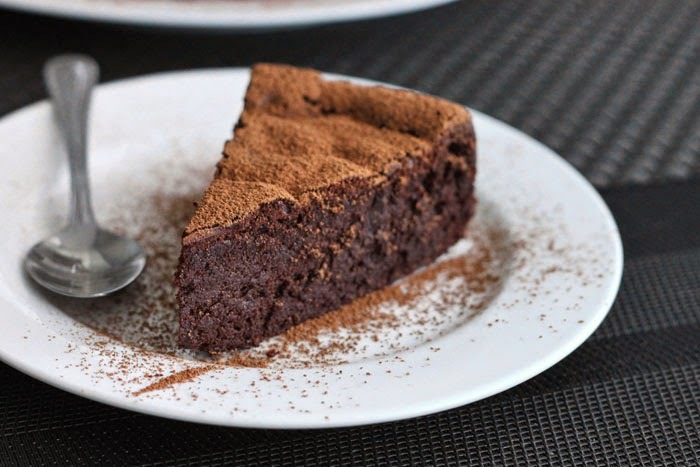 This Chocolate Mousse Cake will become a regular for you. I'm about 97% sure of this. It uses only 4 ingredients - ones that I'm certain you have in your pantry. We need dark chocolate, butter, eggs and just a touch of sugar. If you have a bit more effort in you, a pinch of salt and hit of vanilla bean, or even a dash of spice can transform this on any other occasion. It is flourless, so obviously it is gluten-free, but let's just shout it out anyway. For this recipe you'll need to make a water bath, also known as a "bain marie" in fancy French technical terms. What this means is to bake the cake like it's an island surrounded by hot water. The water will maintain a uniform temperature so that the cake bakes evenly. It also creates a humid environment so that the cake doesn't dry out. This technique is essential to baking a perfect cheesecake - moist, dense and without cracks. You really can have this recipe up in less than 10 minutes. Make sure to whip those eggs like mad. When you think you've whipped them enough, whip them for 1 minute more! They should look nearly white. With a stand mixer on high speed, this usually takes about 5 minutes. Using an electric hand mixer might require another 2 minutes or so. Have a light hand when folding the whipped eggs into the cooled chocolate. The chocolate cannot still be hot at this point because that would deflate the air in the eggs. Use a light hand to get everything incorporated. You can use a wide spatula or a large balloon whisk to do this. Contrary to what many may think, a big fat balloon whisk is more efficient at folding airy ingredients into a mixture than a spatula. The many wires cut through the mixture at once so that less mixing is actually required and the mixture comes together sooner. Just don't use the whisking action, but use the whisk like you would fold with a spatula. This cake is light as ever! Literally, it feels like nothing in your hand, and dissolves instantly on your tongue. It checks all the boxes. Easy made, fast made, decadent and gluten-free (because these days it seems like we all know someone who avoids it). Miles away from butterscotch pudding, it's not even funny. Lesson: no matter the question, the answer is always CHOCOLATE - bittersweet is better! Place a rimmed baking tray on the center rack of your oven (for the water bath) and preheat the oven to 400°F/200°C. Line a 7- or 8-inch round springform pan with baking paper and lightly grease the sides. My pan is a funny size – it’s about 7.5-inches in diameter. Just don’t use anything larger than an 8-inch round or the cake will be too short. Wrap the bottom of the pan with a double layer of foil to prevent water from getting in when you bake it in the water bath. Combine chocolate and butter in a heatproof bowl set over a saucepan of simmering water and stir until completely melted and smooth. Set aside to cool. Place eggs in the bowl of a stand mixer fitted with the whisk attachment and beat until very foamy, about 1 minute on high. Gradually add sugar and continue to beat on high until very thick, voluminous and nearly whitened, about 5 minutes longer. Add one-third of the foamy eggs to the chocolate mixture and fold it in gently. Add the remaining eggs in two parts and fold them in gently until blended. Try not to over-mix and knock all of the air out of the batter. Pour mixture into a prepared pan and then gently place the pan on the rimmed baking tray. 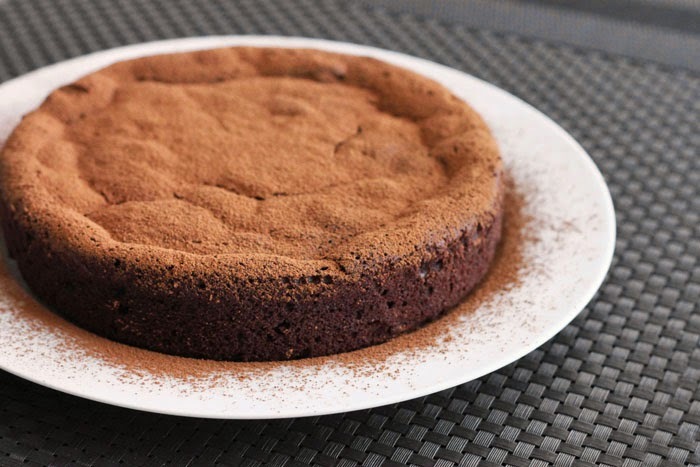 Pour boiling water into the baking tray until it comes about ½ inch up the sides of the cake pan. Bake for 5 minutes, then turn down to 350°F/180°C and bake for about 25-30 minutes. A toothpick will come out with just the tiniest bit of sticky chocolate. If you under-bake it, it will sink too much on cooling, so don’t be afraid to give it the full 30 minutes. Transfer pan to a wire rack to cool completely. Dust with cocoa and serve. I guess everyone has such days when cooking or baking just does not go well :) but this mousse cake looks really great! I agree chocolate is the answer to everything but don't discount butterscotch. The canteen made butterscotch apple charlotte recently and it was amazing. I totally agree about the cooking of the foods "that just aren't me" statement. You madame, have your redemption. I love this recipe. Do you think it could work with a sugar substitute? If so, which would you recommend? I realize chocolate has sugar in it, but I like to cut down where I can. The extra 2 tablespoons in this recipe are mainly functional - they help to stabilize the whipped eggs. You could leave it out all together and just rely on the sugar in the chocolate for sweetness. In this case you need to be extra careful not to deflate the air from the eggs when folding them into the chocolate. One of my biggest kitchen fails was pudding too! Mine was vanilla, and it just didn't taste right - like gelatin but not pudding. This cake looks like a total winner! 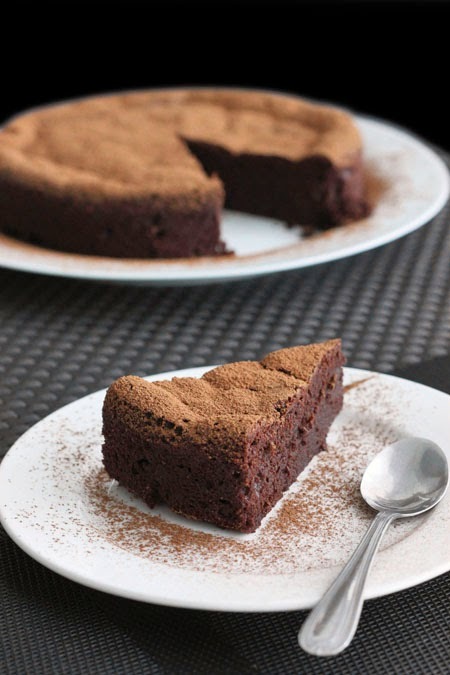 I love that it has only 4 ingredients, and it looks so rich and chocolatey! Seems like pudding's are out to get us! Hi. I only have a 10-inch springform pan. Up to how much should the ingredients be increased or can it be doubled? For a 10-inch pan, I would suggest doubling the recipe. You will need to increase the baking time significantly as well. This will be one of those questions you cringe to see (and I cringe equally to ask), but: Can I make this in an 8x8 square pan that is lined with parchment on all sides? Then place it in the bain marie for baking? I am assuming that the springform pan is to make removal easy and presentation pretty? Thanks. Yes, you probably could but note that the cake will be flatter since a square pan holds more volume than a round one. I have this in the oven , can you refrigerate left overs or will that ruin it ? Thanks ! You absolutely can! It will be even fudgier once chilled. Are the times and temps published for a convection oven? Times and temps are for conventional oven (ie. not fan-forced). Can coconut oil be substituted in this recipe for butter? I have several people I would like to make this for who are dairy-intolerant. Thank you!!! I have not made this with coconut oil. It is a much harder fat than butter.... it might work. Try it! Can I replace the chocolate with raw cacao powder (feeling too lazy to go out and get chocolate lol) and if so how much? 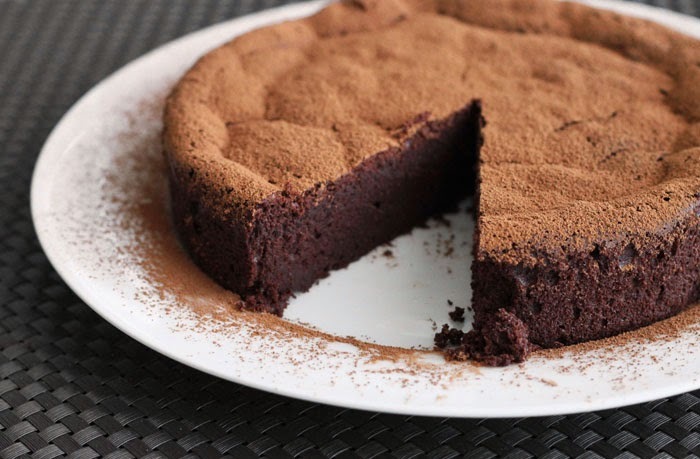 3 level tablespoons unsweetened cocoa powder, 3 tablespoons sugar, and 1 tablespoon butter, margarine or shortening for every 1 ounces of semi-sweet baking chocolate. Hi Raisa, you absolutely need chocolate for this recipe. The best chocolate cake I've ever made! Not too sweet and the consistency was amazing!!! A Big Thank you from Finland! Yikes! You need to use oven-proof glass like Pyrex. I always just use a rimmed metal baking tray. I have had that happen with Pyrex. Sometimes Pyrex will have a tiny air bubble in the glass and will eventually explode. Can I use a silicone cake mould or is a tin pan best for a water bath? 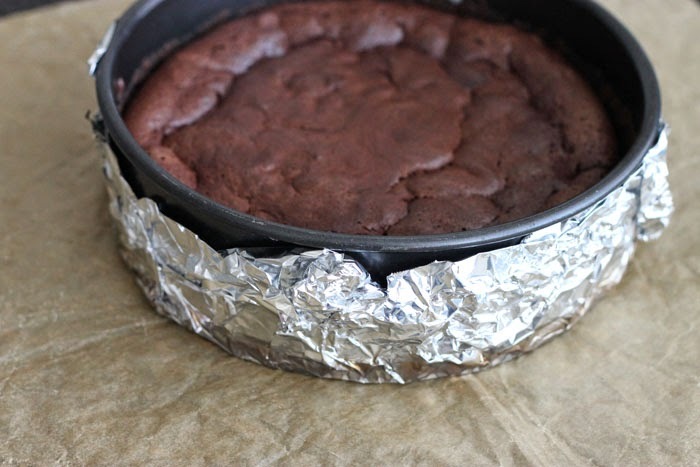 A tin is best, especially a springform pan with removable sides so that you can retrieve the cake without it crumbling apart. only have a 9 inch pan. do I double the recipe? I would do 1.5 times the recipe. I really hate when I've spent ages cooking something that just doesn't work out the way I had hoped. Especially if it's a sauce I've simmered for an hour or more. Nevermind, we all have those days. 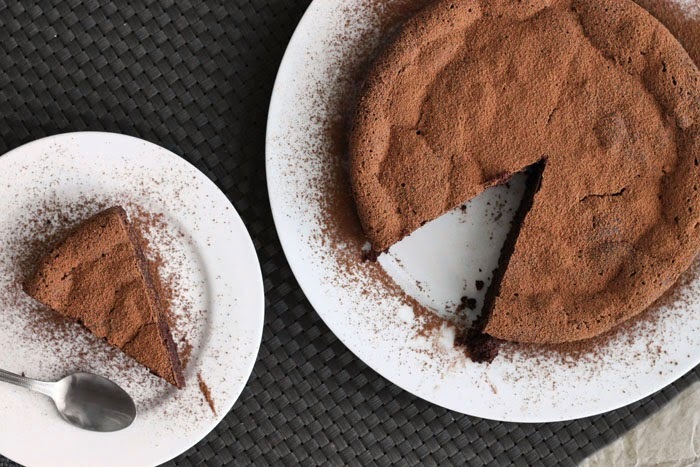 But this chocolate mousse cake has more than redeemed you. Abso-blooming-lutely marvelous. does this recipe use whole eggs to whip and not just the egg whites? Yes it uses whole eggs. Is that dark baking chocolate? Baking chocolate or not, it doesn't matter - it's just a marketing trick. Just use a good quality dark chocolate. What's a marketing trick? Baking chocolate vs. eating chocolate? Do they bake up differently? Hi Sophie - you can use baking chocolate and eating chocolate interchangeably as long as they have the same cocoa content. 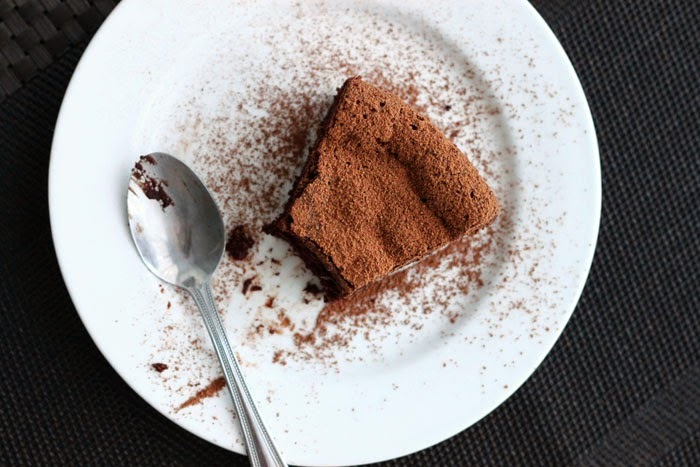 For example, if a recipe calls for bittersweet chocolate, then just look for any good chocolate with 70% cocoa solids. Baking chocolate typically has no flavours (like vanilla) added to it. I always use good quality eating chocolate in my baking. Do you think I could use coconut sugar instead of regular sugar? Really looking forward to making this cake in a couple of days. Just wondering, do you think I could add Frangelico (hazelnut liquor) as a flavouring for the cake? If so, how much should I add and should I adjust any other ingredients? Yes just add 1 or 2 tablespoons in with the melted chocolate! Can you freeze this cake? Wanting to prepare this early. I have never frozen this cake, but I don't advise it. The texture would be compromised. I'm making this for the second time today, it's become my flatmate's favourite because he's not a fan of sweet things. Or oven heats from the bottom so normal cakes don't cook but because this is in a water-bath it totally works. Do you know any other deserts I can make using a water-bath?? Hi Sophie, cheesecake is baked in a water bath. Steamed pudding cakes are too. You can make variations on this one by adding almond meal, berries or other flavour extracts. Hi, Do you think I could make 2 of these with cream sandwiched between the 2? You can, but be aware that these cakes are very delicate. It might be difficult to slice through two layers. If you would like to fill them, I would choose a sturdy filling like chocolate ganache or french buttercream. I made this yesterday and used some of the suggestions in the comments - I added 1 teaspoon of vanilla, 3 tablespoons of almond meal and a cup of raspberries, which I feel helped cut through the richness a bit. I also served it with warmed up frozen mixed berries for a sauce, and thick cream, which also helped because this is very, very rich! My stand mixer is in storage so I just used a handheld electric mixer and it came out fine. But don't do what I did and use a regular tin instead of a springform. It was impossible to get out without breaking it, even though I lined the bottom. Next time I will definitely use a springform and line the base and sides AS WELL as greasing the paper, because this is a sticky cake. Yes, a springform pan is certainly necessary. Glad you enjoyed it, and thanks for taking the time to describe your results!